Assan Aluminyum exports flat rolled aluminum to more than 70 countries and 4 continents, mainly to West Europe and to North America. The company plans to increase its activity in North America with its wholly-owned subsidiary, Kibar Americas, located in Chicago. Assan Aluminyum, the leading manufacturer in the flat-rolled aluminum industry, has been manufacturing coil & sheet, foil and pre-painted aluminum products since its establishment in 1988. The company is currently one of the 3 largest aluminum foil producers in Europe. 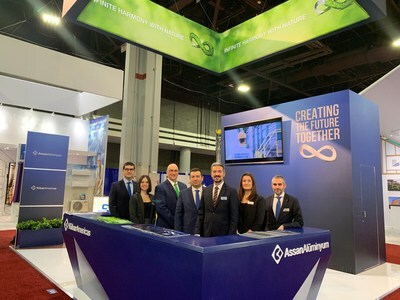 Assan Aluminyum has recently established its fully owned subsidiary, Kibar Americas, in Chicago, where it aims to serve its North American customers. Kibar Americas hosted its business partners at the AHR Expo 2019, the world's largest HVACR event, which took place on January 14-16, in Atlanta attracting over 2000 visitors. The company offers its products to a variety of sectors, such as packaging, distribution, construction, consumer durables, automotive, as well as HVAC, offering particularly finstock foil applications. Assan Aluminyum's vision is based on being more environmentally sustainable. The renewable energy power plant and the in-house recycling facility both serve its sustainability strategy directly by reducing the company's carbon footprint. Its booth design elements at the AHR2019 emphasized the firm's focus on being environmentally sustainable in its processes. The company is evaluating opportunities to expand further in the North American market. Assan Aluminyum's Managing Director Goksal Gungor states: "We aim to strengthen our operations in North America. In order to provide our customers with better and localized service, we have established Kibar Americas, our Chicago based subsidiary, last year. We differentiate ourselves through our core values of reliability, flexibility and innovation. We provide our business partners with tailor-made solutions, as their localized solution partner. Hence our motto: Creating the Future Together, as our business partners are an essential part of our team." Assan Aluminyum has installed two new casting lines and a brand new foil mill recently, while modernizing many of its existing lines. The company will now be able to concentrate more on high value-added products. Additionally, a large-scale investment project, consisting of a direct chill (DC), hot rolling facility, worth approximately 800 million dollars is currently being planned. The company sheds light on the industry, through its strong R&D. With the know-how of its R&D Center, Assan Aluminyum aims to reinforce its position as one of the global pioneers in the continuous casting technology.